Twenty Five years ago today, November 28, 1992, Whitney Houston hit number 1 on the Billboard Hot 100 with "I Will Always Love You." The song was not new. It had been written and recorded in 1973 by Dolly Parton and topped the Country Singles the next year. She took it back to the top with a new version in 1982. But it was Houston's version, recorded for the soundtrack of the film The Bodyguard, that is most associated with the song. She was originally going to record and release a version of Jimmy Ruffin's "What Becomes of the Broken Hearted" but, when it came out that the song was going to be used in the film Fried Green Tomatoes, it was decided to record the Parton tune. When record company executives first heard the single, they balked at the a cappella intro but Houston and co-star Kevin Costner disagreed and they held out for the original arrangement. 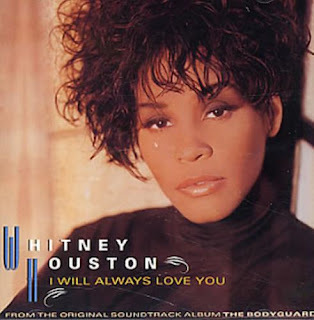 "I Will Always Love You" hit number 1 on November 28 and stayed there through the week of February 27, 1993, a total of 14 weeks, breaking the record that had been set just four months earlier when Boyz II Men's End of the Road held the top for 13 weeks. Up until those releases, Debby Boone had been the record holder for the Hot 100 era with ten weeks for her song "You Light Up My Life" although, pre-Hot 100, Elvis Presley held the top for 11 weeks with "Don't Be Cruel" / "Hound Dog".